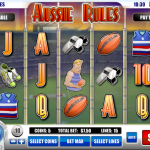 Aussie Rules slots is a game is based on Australian Football which means there are very few rules at all. That means that the whole game gives a feeling of a festival, tons of fun, crows cheering and of course the players. You can win prizes when finding themed sporting items but you could also play bonus rounds that include Wild Referees, Jackpot Jerseys, get Free Spins! On top of that there is the Football Bonus which allows you to test your kicking skills. 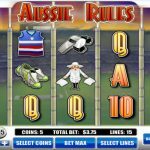 Aussie Rules is a generous games that gives prizes and many bonuses. The Football Bonus will allow you to kick your way towards winning some cash. When you match 3 to 5 symbols you start winning prizes which pay between 4 to 150 coins. If you find the special items the prizes can be even bigger! for example the Whistle will pay up to 250 coins, Boots up to 300 coins and Players up to 400 coins. The Wild Referee can substitute any basic symbol but can also award instant wins when multiple such symbols appear in a line. 1000 for 4 Referees and 5000 for 5 Referees! The Jackpot Jersey can award up to 500 times your total bet! Water Bottle triggers free spins when your get 3-5 of them. 3 bottles trigger 10 free spins, 4 trigger 20 and 5 trigger 100 free spins! Bonus Football means a free invite to kick your luck and win instant prizes! Just like playing the real game, Aussie Rules slot is an adrenaline rush. This game might not be the newest around but there’s a reason why it stuck around since 2010. The game is good for beginners and you could play for a while with very small bets but also seasoned players would enjoy it very much. Love 5 reel slots? 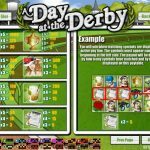 Try A Day At The Derby, a 5 reel slot by Rival.